Bobby Ghosh, foreign affairs columnist and commentator, joined CBSN's Elaine Quijano on Monday to describe how some companies are finding alternatives to mining an important and expensive metal that's used in 21st century tech gadgets and products around the world. 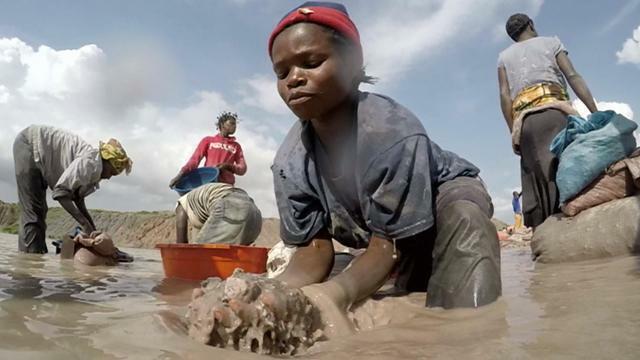 Ghosh explained the significance of cobalt in the wake of a CBS News investigation that found children mining cobalt in the Democratic Republic of Congo (DRC). "Lithium batteries are everywhere -- they are in our cars, our phones, our laptops ... there are three or four different kinds of lithium batteries ... one kind has about 50 percent cobalt ... a very, very important component," he said. "It's very hard to think about lithium batteries without cobalt." "Maybe 15 years ago cobalt was worth nothing," he added. "There were cobalt mines in Idaho ... in Canada ... that shut down because nobody wanted it. Now with all our new tech batteries ... cobalt is a very big deal ... $80,000 a ton." About 60 percent of cobalt originates from the DRC, while 6 percent comes from Canada. Apple is reportedly planning to buy cobalt directly from mines, removing the middleman processes. Ghosh agreed with that plan. "That would be a good thing," he said. "You have a greater control over who is producing the cobalt and how it's bringing brought back. There are environmentally sustainable ways and avoiding child labor ... you're paying a fair price. The prices listed on that factory were ridiculous." Ghosh also suggested that it would be better if the mining of this material would be moved closer to the places where they are being produced. "Right now, Congo -- like a lot of places -- are exporting most of this raw material and the refining, where the real value addition is done, is done outside," Ghosh explained. "The government of Congo would like people to come do that refining in the Congo, that would probably be a good thing." Ghosh touched on the topic of Tesla and its plan to mine cobalt in North America for its batteries that power the company's electric cars. It's expected that electric cars will double the world's demand for cobalt by 2025. "The place they're looking for is ironically called 'Cobalt' ... it's in Ontario, Canada ... there are deposits of cobalt there, but I'm not sure how much," Ghosh said. "The fact that Tesla thinks it can get enough cobalt from there to produce its battery is a good sign. But it will be much more expensive ... but we can be sure that it will be mined under strict controls ... there will not be child labor." Ghosh pointed out that that plan wouldn't eradicate child labor in DRC, as some buyers won't care when they purchase it from that region. "We may feel better about ourselves, but those kids will still be working those mines, unless a larger effort is made to save them from that," he added. Watch more of CBSN's interview with Bobby Ghosh in the video player at the top of the page, or by clicking here. On Tuesday, watch "CBS This Morning" for more reporting on this investigation.